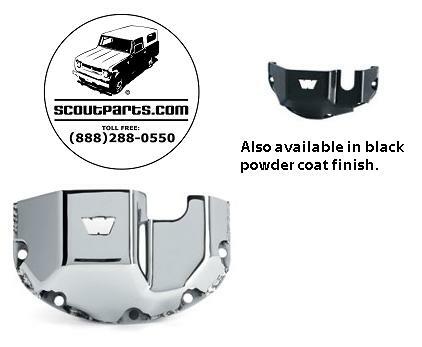 Get protection for your front and rear differentials with these armored differential covers. Made by Warn, which was one of the original OEMs for International, these guards will keep your axle gears safe, protecting against oil loss in the event you bash your oil cover into rocks inadvertently. Dress it up in beautiful polished stainless steel, or go for the subtle look with black powdercoat. Made of welded 3/16" steel, these diff guards could keep you from getting stranded someplace you don't want to be. These fit the rear and front axles in Scout 80, as well as the front axles in certain Scout II trucks.